Keyboard guru Derek Sherinian is bound to turn the heads of those with preconceived ideas of his latest release 'Molecular Heinosity.' Though Sherinian performs and produces with the usual acumen and professionalism, he is certainly not the star of this album. No, 'Molecular Heinosity' is a more guitar-centered piece featuring axemen Zakk Wylde, Brett Garsed, and Rusty Cooley setting their fret boards aflame. Yet, Sherinian is still able to apply his artistry and proficiency of fusing jazz, rock and metal into the majority of arrangements. 'Molecular Heinosity,' except for the last song, is essentially an instrumental progressive metal album. The fusion element, so natural to Sherinian, is quite evident on such tracks as 'Antarctica,' 'Ascension' and 'Molecular Heinosity.' For a pure metal edge, the killer tracks on this work are 'Wings Of Insanity' where Zakk Wylde brings the fireworks, and 'Frozen Fire' with Rusty Cooley ripping it up. Equally thrilling and even it bit more surprising is the single vocal track, 'So Far Gone,' where Wilde, sounding like Ozzy's doppelganger, lends his voice. With its dark and eerie atmosphere, this piece is likely to be the quintessential fusion piece on the whole disc. 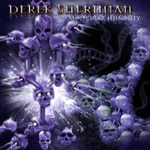 Sherinian's 'Molecular Heinosity' defies expectations while at the same time confirming Sherinian's place as a master composer of progressive metal. With his perplexing fusion arrangements as a foundation, Sherinian surprises us by making the heart of this work a guitar-lover's shred heaven. It's all good by me, and very recommended.